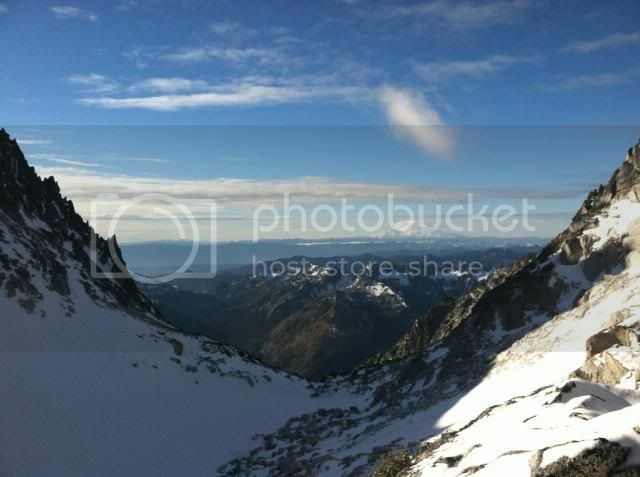 November 1, 2013 - Colchcuck Glacier! I was excited, but not quite excited enough to leave the house as early as necessary for a day trip to Daniel.� Hmm.. 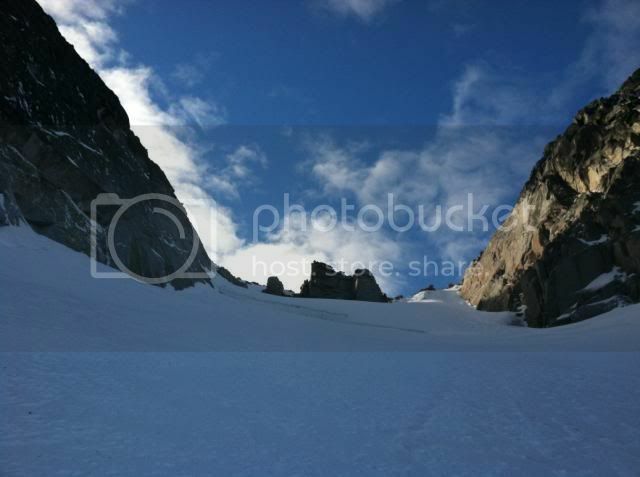 I know; Colchuck Glacier!� If Daniel's rocks are covered, the permanent snowfield at Colchuck must be super buff! 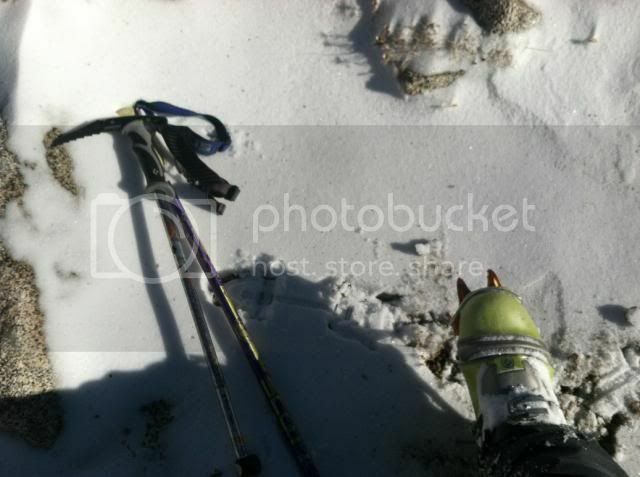 WRONG.� I�ve made this mistake before, and this time was no different.� Snow conditions at Mt. 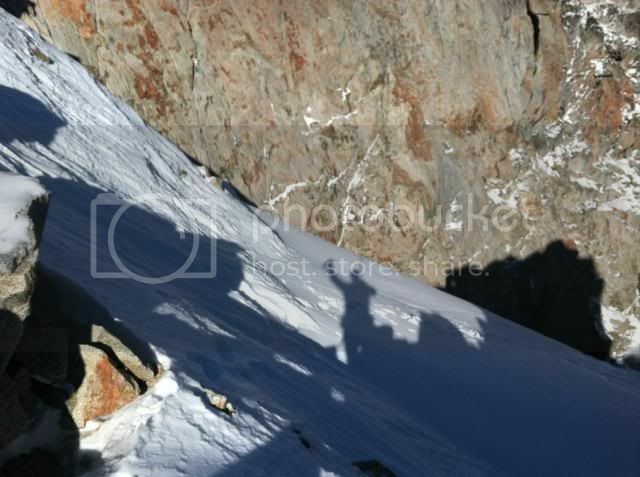 Daniel DO NOT equate to snow conditions in the Enchantments.� How much new snow at Colchuck Col?� Not much. 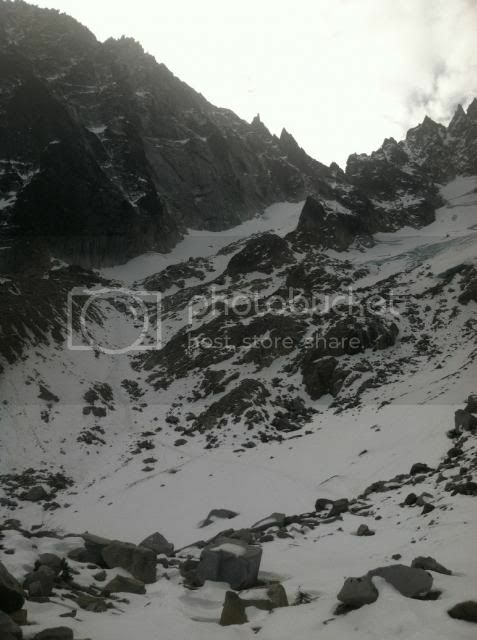 Looking up from the morain.� I skied every bit of that! Nice view south to Rainier and Adams. I�m sorry to report that the skiing didn�t live up to my expectations.� Ol� tsuyoshi�s tracks on Daniel were not to be recreated here.� At least not today.� Skiing was inconsistent.� Best patches were the rippled wind buffed patches, but those were small.� Between the good patches were crusty or ice chunks, or sugar/buff/sugar/buff sections.� It was fun, but it wasn�t good.� The most challenging sections were those skinny patches where, days earlier, other climbers had walked side by side, leaving boot prints that froze.� I couldn�t side slip through those because the crust was too thin.� I side-stepped a couple short sections that I would have otherwise slipped had the snow allowed it. 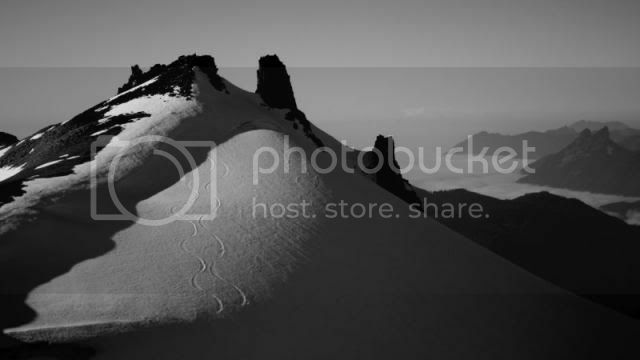 Here�s one where from the top.� At this point, the surface looks good, and I still believe I�m going to arc big turns down the wind buff.� HA! Re: November 1, 2013 - Colchcuck Glacier! I had originally planned on skiing somewhere in the stuart range the day we skied daniel. I am now very glad we didn't! We thought it might be a bit too far east and too dry. Way to get after it and check it out anyway. I feel like its days like you had that make the good days so much better!!!! And, I'm still jealous of you because I was at work. So Mike, as kind of a general statement about pursuing skiing the year around, and with you report of crappy snow. All I could think about all day long, was that you were out skiing, and I was home not skiing! Rolfs, your drive never ever fails to impress! Nice effort getting you and your kit up there for some dubious turns. Thanks for the conditions pics! We backpacked up to Colchuck lake last weekend. Looked pretty thin up there. 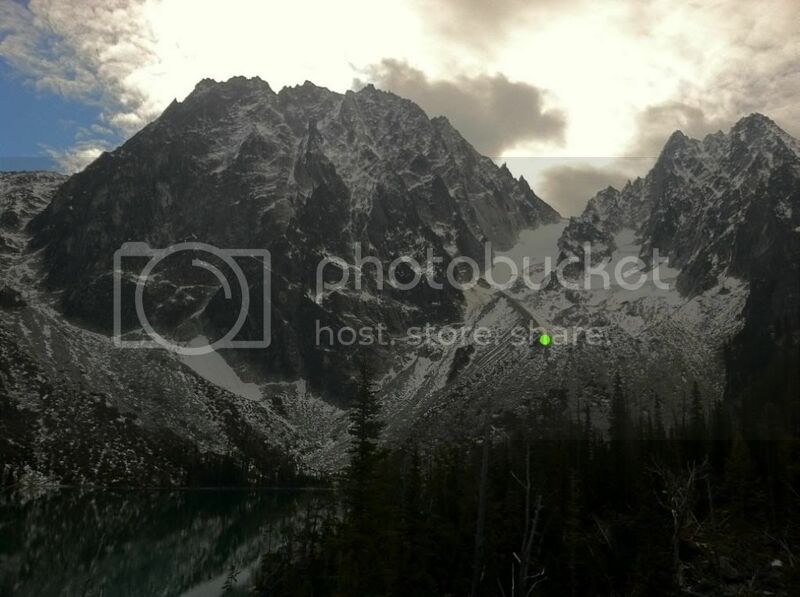 As of Nov. 3, Colchuck Glacier is loaded with new snow. It would have made a wonderful ski today, but we were wallowing up to our waists trying to climb Colchuck Peak. The boulder field on the other hand is pretty miserable, with just enough snow to make things very tedious.